The name of the condition. A ConditionTypes enumeration value: Equal, NotEqual, StartsWith, EndsWith, Contains, DoesNotContain, Greater, GreaterOrEqual, Less, LessOrEqual, Between, NotBetween. A string for the first value used to test the condition. A string for the second value used to test the condition. An "ApplyToRow" boolean that if true allows you to format the entire row that the cell appears in. The ConditionalFormattingObject also contains formatting properties for the cell, row and text alignment. CellBackColor: Sets the background color for the cell. CellForeColor: Sets the cell text font color. CellFont: Sets the cell text font. 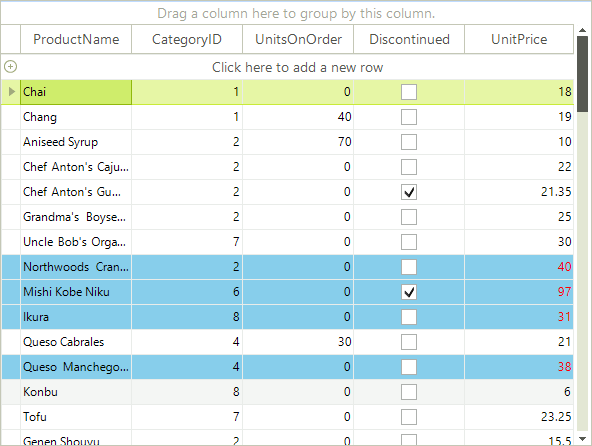 RowBackColor: Sets the background color for the entire row that the cell appears in. RowForeColor: Sets the cell text font color for the entire row that the cell appears in. RowFont: Sets the cell text font for the entire row that the cell appears in. TextAlignment is a ContentAlignment enumeration value that can be TopLeft, TopCenter, TopRight, MiddleLeft, MiddleCenter, MiddleRight, BottomLeft, BottomCenter and BottomRight. This example looks for the same condition as the cell formatting example. The difference is that the last parameter ("ApplyToRow") passed to the ConditionalFormattingObject is set to true, allowing the RowBackColor property to be recognized. The declarative nature of Conditional Formatting limits the situations in which it can be used. While the provided functionality covers most scenarios, there are situations in which you will need to use events.